Suppliers | Equipment Sales & Service | Sanco Products Co. When manual cleaning tools and elbow grease aren’t enough, Sanco’s equipment specialists provide automated solutions for every cleaning application and environment. But it’s not just about making the job easier and getting better results, it’s about decreasing labor costs by increasing productivity…getting the job done faster. By using our custom SSS Achieve Pro software program we can advise you beyond simply selecting the right machine. 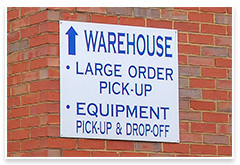 We can consult with you on the full range of factors that impact the efficient management of a clean facility . 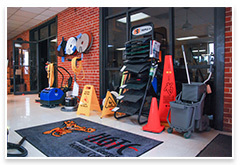 From vacuum cleaners to rider (ride-on) scrubbers and sweepers, it’s valuable to see a machine work for you in your facility before making an investment. That’s why we offer on-site demonstrations of all our stock equipment. 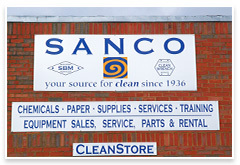 Sanco’s CleanWrench Service Department offers service and parts for virtually all makes and models. Our mobile techs are available for on-site service calls and pickups when transporting a machine to our shop isn’t practical. In addition, our CleanSpare* program often can provide a loaner machine to keep operators up and running when downtime on a job can be costly. 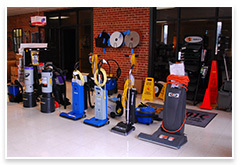 Some cleaning jobs may not require a long term investment in a piece equipment. When purchasing isn’t necessary, please ask about our rental fleet to see if we have the right machine available for you. *Leases available on most models through our equipment lease program, CleanLease. *CleanSpare program available to CleanPlus premium customers & based on availability.